Activists work to break Israel's siege of Gaza aboard the Strofades IV after their ship was taken over in Libya. Athens, Greece (CNN) -- A Gaza-bound aid ship was in limbo Saturday after docking at a Greek port, with Greek authorities waiting for legal documents before letting any passengers and crew disembark. The ship left the Libyan port of Derna unexpectedly Thursday after the ship's captain got into an argument and suddenly set sail with none of the aid cargo and only a fraction of the volunteers intending to accompany it to Egypt, where the goods would be taken by land to Gaza. The charity sponsoring the voyage, London, England-based Road to Hope, complained the captain "went nuts" and kidnapped the 10 convoy members on board. The ship docked in the Greek port of Piraeus on Friday with the activists and a 16-member crew, according to the Greek news agency ANA. The Greek Merchant Marine Ministry said Saturday "no incriminating evidence has been found against those on board," but it said no one can leave the ship until authorities receive the proper documents. "For the final resolution of this case, authorities are waiting for the completion of the necessary procedures for the issuing of legal documents by their respective embassies allowing entry into the country for those on board," the ministry said in a statement. A ministry spokesman explained, "Neither passengers nor crew had their passports or other documents on them as the ship left Libya unexpectedly, which is why we have to wait for legal documents proving their identity before we can let them go." The 10 convoy members include citizens of Britain, Ireland, Algeria, and Morocco, according to Road to Hope. Of the crew members, 10 are from Ukraine and six are from Egypt, according to ANA. 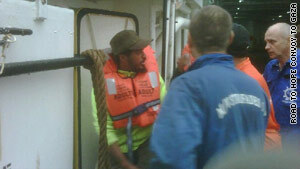 The argument with the ship's captain was over a pay dispute, ANA reported. Ship owners Ionian Bridge said Friday the activists had boarded the vessel, the Strofades IV, without any contract or charter, despite claiming to have paid for the transport of the aid, ANA said. It said the ship's captain left Libya unexpectedly because he feared for the safety of the ship and crew. Ionian Bridge said there was a "tense atmosphere" aboard the vessel in Libya and no response from the Libyan authorities, so the skipper set sail for international waters, ANA reported. If all had gone according to plan, the ship would have left loaded with aid and a total of 65 volunteers aboard, according to Road to Hope. Ellie Merton, a representative of the charity, said Friday that the members of the convoy who were left behind remained determined to reach Gaza before Eid, the upcoming Muslim holiday that commemorates the prophet Ibrahim's willingness to sacrifice his son for God. "That's the urgency of the situation, because they want to get the aid into the besieged people," she said.